This is a “sequel” to the author’s previous post An End-to-End Prototype of PlayReady Protection with ACS Authentication and ACS Token Authorization. In certain cases, full DRM protection may not be mandated or make economic sense. Instead, AES encryption can be an alternative. However, keep in mind that AES encryption is very different from and is not DRM. The differences between DRM and AES encryption can be summarized by the following table. Nature of content to be protected Applicable to content of shared interests, such as videos Applicable to personal content, users are trusted not to share. Azure Media Services Content Protection also makes “1-Click” AES encryption a reality thanks to the dynamic AES encryption feature. In this blog, we will present an end-to-end prototype of AES encryption of smooth streaming asset with token authorization. The authorization token is issued by the same ACS 2.0 namespace as used in the end-to-end prototype for PlayReady protection. The design of this end-to-end prototype is illustrated by the following diagram. The end-to-end prototype is hosted in Azure and Azure Media Services. Below is the information related to the prototype. Browse to the OSMF player built with Adaptive Streaming Plugin for OSMF. The needed information is already on the player page UI. Notice that each click of "Play" button results in a request of new authorization token from ACS and the new authorization token is then used by the OSMF plugin to request for the decryption key for playback. The authorization token from ACS 2.0 namespace is shown on the player page. Below is the player screenshot. Develop a OSMF player which handles ACS authentication, authorization token request, decryption key request and video playback. We chose to use OSMF player for this prototype because Microsoft Adaptive Streaming Plugin for OSMF supports AES encryption of smooth streaming content for both on-demand and live. The first step is to create envelope type content key. The code is below. Next, we create the authorization policy and add it to the content key created above. As shown in this diagram, each IContentKey has a single instance of IContentKeyAuthorizationPolicy. The following code creates an IContentKeyAuthorizationPolicy and attach to the IContentKey. In the above, the method ContentKeyAuthorizationHelper.CreateRestrictionRequirements() is defined as below. //   the Initialization Vector (IV) to use for the envelope encryption. After running this, you need to publish the asset, either programmatically via API or using Azure portal. We can simply use the same ACS 2.0 namespace we set up in the blog An End-to-End Prototype of PlayReady Protection with ACS Authentication and ACS Token Authorization, with the same symmetric verification key, same Service Identity, same issuer and scope, etc.. When you set up ACS Service Identity, you may choose either Password or Symmetric Key credential types. Both cases are supported by the prototype (token request code below). Download smooth streaming manifest which indicates AES-128 encrypted content and contains the key delivery URL, as seen in the client manifest of our test asset. First the code to request authorization token from ACS namespace is as below. Video player application hosted in Azure IaaS VM, which handles ACS authentication, ACS authorization, decryption key acquisition and video playback. UPDATES: On 1/6/2015: The OSMF-plugin player has been enhanced for testing AES encryption in more general scenarios: It now works with any Azure ACS namespace instead of just the ACS namespace used for the end-to-end implementation discussed in this blog. You can just replace my ACS namespace parameters/secrets by yours to test. 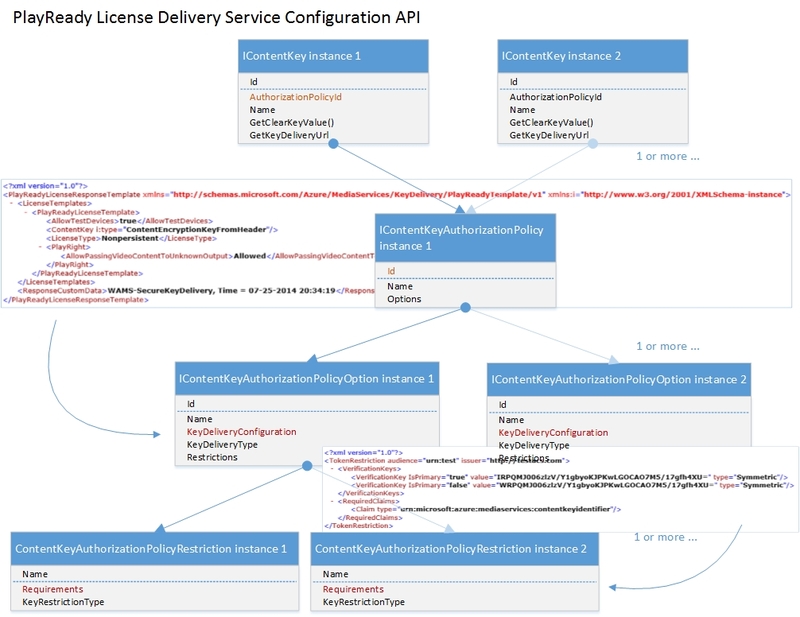 On 1/23/2015: With the release of JWT support in AMS Content Protection, this prototype has been expanded to include token restriction with JWT by using Azure Active Directory (AAD) as both STS and IdP. AMS batch job (for setting up dynamic PlayReady protection or AES encryption): knows AAD tenant, but nothing about player app (any player is fine). AAD tenant: knows player app, but nothing about the AMS batch job. Player app: knows AAD tenant, but nothing about AMS or AMS batch job. In order words, AAD tenant and player app know each other. AMS batch job knows AAD tenant, but does not care what player consumes the contents. ACKNOWLEDGMENT: Special thanks to Quintin Burns, George Trifonov and Mingfei Yan of Microsoft Azure Media Services Team, who have provided significant help in this effort.